Safe Kids Day – Everyday! What do I have in common with Drew Barrymore, Boy George, and The Fonz? We are all excited to help promote Safe Kids Day. This is a sponsored post written by me on behalf of Nationwide Mutual Insurance Company. All opinions are 100% mine. As parents and caregivers, we want to put our kids in a bubble so we can watch them 100% of the time, but reality is that we can’t have eyes on them 24/7. Children are inherently inquisitive and want to explore everything. It only takes a minute for a child to get into something they shouldn’t and for something tragic to happen. Babies and toddlers put EVERYTHING in their mouths. Toddlers and littles like to climb. And just when you think they are out of that dangerous stage, they start crossing the street by themselves. Holding a cell phone. Without looking. We live close to the school, and I remember the first time Stepson was allowed to walk home from school by himself. Even after we practiced together, it was still a nervous moment. I met him at the school and then let him go off on his own. I will not confirm nor deny if I hid in the bushes and behind trees to watch him as he walked home. He kept looking back to see if I was there but I wanted him to feel the independence he deserved and earned. I held my breath as he crossed the street. He did what I taught him to do. He made eye contact with the driver, waited for them to motion. And then… he extended his arms and put out his hands in a “STOP” and crossed the street like that. Several years later, he’s now a Senior Crossing Guard to help the littles cross the street at the school. Kids are always going to be kids. They are curious, and their brains are developing. It’s up to us to minimize safety obstacles and maximize safety training. How do we do this? With Safe Kids Day! 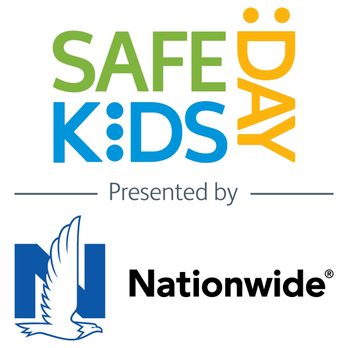 How Can I Participate in Safe Kids Day? Safe Kids Day will take place across the country through local programs for anyone to participate. You can find out where events are happening near you by visiting the Safe Kids website at https://www.safekids.org/safekidsday/local-events. In addition to celebrating at a local event, parents are encouraged to take action to make their home safer for their children by creating their very own checklist of safety actions from a master checklist of activities with #MyHigh5. My High 5 makes it easy for parents to pick the safety actions that make the most sense for their family. Nationwide and Safe Kids have developed a checklist related to four critical safety areas: TV and furniture tip-overs, poisoning, drowning and fire. You can see these safety tips in action in a new short video. As parents, let’s join in making a promise to our children to do everything in our power to make our homes safer, every day. As you think about ways that you can protect your children from accidental injuries, start by visiting the Make Safe Happen website and downloading the app. Both are resources that share age appropriate and room-specific tips to help prevent injuries. Love, hugs, and keeping our kids safe. Great tips and great crowd to hang with. 🙂 Pinning now.